This biblical narrative, recounted in 1 Samuel 25:2–42, describes an episode during David's exile in the wilderness in southern Judah. David, in need of provisions, sent some of his men to request aid from a wealthy sheep farmer named Nabal, whose herd David had let graze unmolested all winter. The sheep farmer curtly refused their request. Infuriated, David set out with 400 armed men to seek revenge. Nabal's wife, Abigail, having learned of David's impending attack, quickly packed generous provisions—including bread, wine, meat, and fruit—on the backs of donkeys, and set out to intercept David and his soldiers. She pleaded with David to forego his punitive action, reminding him that he was fighting the Lord's battles and should not allow evil into his life. Abigail returned home and her joyous news caused her husband's heart to die "within him, and he became as a stone." Upon hearing of Nabal's death, David assumed that God had acted to support his cause and rejoiced, after which he promptly sent servants to ask Abigail to marry him. She consented and became David's second wife. The Old Testament is filled with poignant stories of the often harsh-and-cruel world of ancient Israel where, despite human frailties and personal betrayals, the followers of Moses formed a nation through spiritual faith, military valor, forgiveness of—and reconciliation with—bitter antagonists. Peter Paul Rubens, perhaps more than any other artist, internalized the force of these narratives and captured their powerful emotional impact in his expressive images. 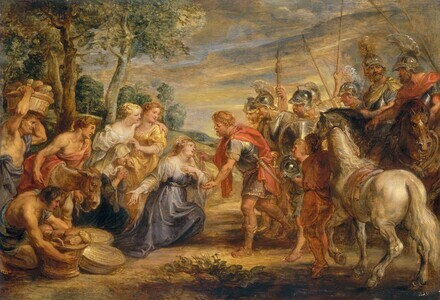 Yet the meeting of David and Abigail is a story of reconciliation, a quality Rubens suggests with the gentle forward movements of two distinctive figural groups who come together in a peaceful landscape. As Abigail kneels before David and offers him the gift of bread, the military leader, touched by her eloquence and humility, tenderly reaches out to help her rise. Through Abigail's gaze and gesture, Rubens conveys that Abigail's beauty and sincere supplication have successfully persuaded David to forego his intended attack against her husband. By bringing emotional nourishment and encouraging peace, Abigail represents a prefiguration of the Virgin as intercessor. Rubens, who was profoundly Catholic, received many commissions for religious works, including altarpieces and designs for tapestries. He painted this luminous oil sketch, which may have served as a model for a tapestry, in the early 1630s, shortly after he had returned to Antwerp following delicate diplomatic assignments in Spain and England at the behest of King Philip IV of Spain, missions that he accomplished under the cover of his activities as an artist. The fluid brushwork and flickering highlights that both model and accentuate forms; the deeply resonant colors; and the broad, atmospheric handling of the landscape all reflect Rubens's appreciation of Titian's and Veronese's artistic achievements—two Venetian masters whose works he studied in Madrid and London in the late 1620s. Italian artists' influence on Rubens had begun much earlier, in fact. Around 1600, Rubens, who had been trained in classical ideals and philosophy, travelled from Antwerp to Italy to experience firsthand its artistic traditions, not only those of antiquity and the Renaissance, but also those being created by contemporary artists such as Caravaggio. The inspiration he gained from this multifaceted exposure profoundly affected his own style of painting and became the foundation for his future work. Rubens returned to Antwerp in 1609 and became court painter to the regents for the Spanish king in the Southern Netherlands, Archduke Albert and Archduchess Isabella. With dramatic narratives like The Meeting of David and Abigail, executed in a bold and fluid style, Rubens had a strong and long-lasting impact on artists throughout Europe. One of the greatest masters of the 17th century, Rubens's artistic legacy cannot be overestimated. Andrzej Wierzbicki, Warsaw, 1935. (M. Knoedler & Co., New York), by 1957; private collection, United States; purchased c. 1963 by Dr. and Mrs. Rudolf J. Heinemann, New York; by inheritance 1975 to Lore [Mrs. Rudolf J.] Heinemann [d. 1996], New York; her estate; bequest 1997 to NGA. Records received with the Heinemann bequest (in NGA curatorial files) mention a painting in a 1729 sale (unidentified seller[s], The Hague, 3 May 1729, no. 34) described as "Een nette Schets, zynde de Ontmoeting van David en Abigaël, zeer fray, door denzelven [Rubbens (sic)]" (translation: "A handsome sketch, being the Meeting of David and Abigail, very fine, by the same;" see Gerard Hoet, Catalogus of naamlyst van schilderyen, met derzelver pryzen, zedert een langen reeks van jaaren zoo in Holland als op andere plaatzen in het openbaar verkogt, benevens een verzameling van listen van verscheyden nog in wezen zynde cabinetten, 3 vols., The Hague, 1752-1770, reprint ed. Soest, 1976: 3:5). The existence of several copies of the Gallery's painting makes it impossible to confirm to which painting this entry refers. Wilhelm Valentiner gave Michael Jaffé a photograph of the Gallery's painting, taken in Warsaw, that was annotated on the back with the name of the Wierzbicki collection. Jaffé spelled the name Wieszbicki, but Monika Krol at the Royal Castle Museum, Warsaw, has kindly researched the family and determined this owner was likely Andrzej Wierzbicki (1877-1961). He was born in Warsaw, studied at The Technology Institute in St. Petersburg, Russia, then returned to his birthplace in 1913 to begin a career as an industrialist and politician. When Jaffé first saw the actual painting in about 1963, it had been "recently acquired by Dr. Rudolf Heinemann from another collection in the U.S.A." (Jaffé, Michael. "Rubens's 'David and Abigail.'" The Burlington Magazine 114, December 1972: 863.) Roger A. d'Hulst and M. Vandenven, Rubens: The Old Masters, Suffolk, 1989: no. 41a, give the date of Wierzbicki ownership as 1935, and that of Knoedler as 1957. Jaffé, Michael. "Rubens' Sketching in Paint." Art News 52 (May 1953): 36, 64, repro. Die Sammlung Heule. Aus dem grossen Jahrhundert der niederländischen Malerei. Exh. cat. Wallraf-Richartz Museum. Cologne, 1964: unpaginated, under no. 31. Jaffé, Michael. "Rubens's 'David and Abigail.'" The Burlington Magazine 114 (December 1972: 863, repro. Held, Julius S. The Oil Sketches of Peter Paul Rubens. A Critical Catalogue. 2 vols. Princeton, 1980: 1:435-436, no. 315; 2:repro. d'Hulst, Roger A., and M. Vandenven. Rubens: The Old Testament (Corpus Rubenianum Ludwig Burchard, Part 3). London, 1989: 134-136, no. 41a, repro. Mai, Ekkehard, and Hans Vlieghe, eds. Von Bruegel bis Rubens: Das goldene Jahrhundert der flämischen Malerei. Exh. cat. Wallraf-Richartz-Museum, Cologne; Kunsthistorisches Museum, Vienna. Cologne, 1992: 594, under no. 184.1. Wheelock, Arthur K., Jr. Flemish Paintings of the Seventeenth Century. The Collections of the National Gallery of Art Systematic Catalogue. Washington, D.C., 2005: 206-210, color repro.